Did you know that there are online dating sites that target specific religions? Yes, one of them would be Catholic Match, and you’re probably here because you are researching about it. 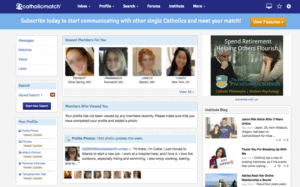 This Catholic Match review will help you decide if this is an excellent online dating site or not. When it comes to getting into a serious relationship, people want to be with someone that they can proudly bring home to their parents. This is most especially true when it comes to Catholic individuals. But due to the lifestyle that many people are practicing today, some are losing their Catholic values. This means that it can be challenging to find someone who has the same Catholic values as you does. Fortunately, there are now a lot of online dating sites today that cater to a specific religion. 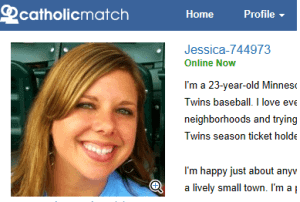 One of these online dating sites would be the Catholic Match. Let’s get to know more about it by heading to the information provided for you below. Catholic Match is for single Catholics who are looking for other Catholic men with whom they can be friends with. Of course, friendship will lead to something else until it ends in a marriage. This online dating site is also here to provide support to the community and education to live entirely by dating purposefully. 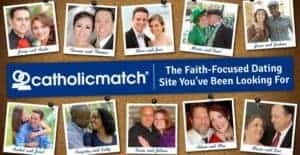 There are more than a million members of Catholic Match, which proved that more and more Catholic singles prefer online dating that the traditional ones. 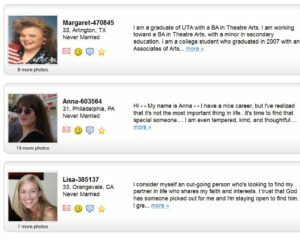 This is the reason why the online site gained a hundred percent legitimacy in the world of online dating. They have also increased legitimacy in the Catholic community, especially that more and more people are joining the online dating community. 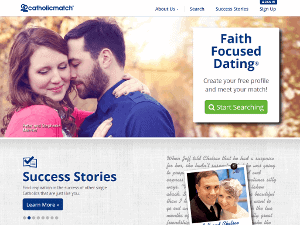 Unlike other online dating sites, creating an account on Catholic Match will take some time. The reason behind this is because you need to complete the profile before you can access all the features. The first thing that you need to do is to input your email, name, password, gender, and location. You will also be asked to provide your diocese, marital status, and birth date. There will also be some basic questions that you need to answer. Some of these questions may be about your appearance if you have any children, your background and so much more. There are also some instances where you will need to input your political views and other personal views. There are also questions where you need to answer yes or no. Some of these questions may be about the teachings of the bible and church. There are tons of questions and answering them truthfully would be best. Some people think that once they have completed the profile and answered all the questions, they think that they no longer need to upload their photos. But this is a crucial mistake since no one wants to chat with someone without a face. So if you’re not going to upload a photo, you should never expect a response from someone on the site. If you want to make sure that you will be able to meet women on Catholic Match, then writing an attractive profile is the answer. You need to describe yourself as detailed as possible for women to at least get to know you. Don’t overdo it to leave a little mystery about yourself. Of course, it would be best to add the best photo that you have. This will help attract women, the same way you get drawn to them. You also need to be ready because you will be investing effort and time with these women. You will be exchanging messages and take the time to get to know them. Women who are known as first-class will always demand nothing but perfection so still make sure to be ahead of the game. Know how to use spelling, punctuations, and more. Always put in mind that you only have one chance in making a good impression. According to a survey, women usually judge their date by the man’s grammar. Avoid describing yourself using the old boring adjectives. The best thing that you can do is to show them. Describe yourself as to how you see yourself as someone who is smart and funny. When describing your life, it would be best to use imagery and vivid words. This will make her more eager to be with you and get to know you. 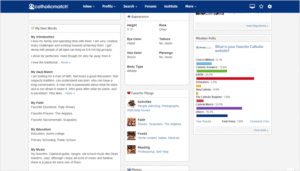 Avoid rushing through your profile because women usually take time in reading men’s profiles. If you rush, you might commit some unnecessary mistakes, which you surely don’t want. Do not write anything that is negative, even if it is true. Women are not into dramas of your past relationship, so it would be better to avoid discussing this. Avoid making yourself look like the victim because women don’t like it. Don’t ever forget to describe the kind of woman that you want. In this way, women will know if you are the type that they’ve been looking for. Amongst the three, you can get the value of your money by availing of the six-month membership. 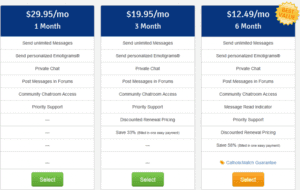 But if you want to try out the site first, then getting the one-month membership would be ideal. With all the above being said, if you are looking for a woman with the same Catholic values as you, then signing up would be best. It, of course, comes with a membership, and they come with a price. But they sure do have features that will make finding a match more comfortable and more successful. Now that you’re done reading this Catholic Match review, it would be best to start signing up!